Made of high quality, environmental-friendly, non-toxic, non- methanal child safe materials. Excellent workmanship,all smooth edges. Won't hurt kids small hands. Designed for kids ages 3 years old and up, providing hours of creative activity that is both educational and enjoyable. Perfect for classroom, home, daycare, learning center. Great gifts for buddy artist and school kids. Please make sure the protective film cover on the board was removed before using for easy wipe clean. Please notice that the package is currently labeling in Chinese. Adults' assemble needed and adults' supervisions advised. In case of kids or children put into other accessories into mouth. For any questions or concerns such as how to set up or something else, please feel free to email us anytime. We will reach you out at the soonest. Includes 1 double-sided easel, 1 tray, 1 box of chalks, 1 chalk cap, 1 set of magnetic numbers and symbols, 1 board eraser, 1 set of magnetic geometry tangram puzzle. Smart design and lightweight. It folds up easily for easy storage, easy to set up. Larger drawing surfaces for more active creative space. 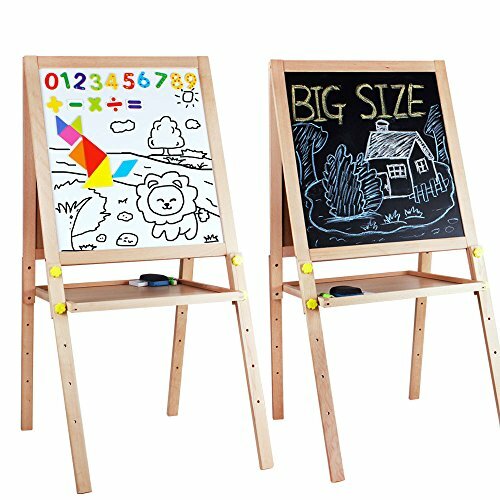 Multi-use easel to inspire painting, drafting, doodling and countless ways to play creatively, develop kids fine motor skills, hand-eye coordination, spatial thinking, learning and problem solving skills. Adjustable legs allow you to change the height to suit for different age needs. Height in the range of 33" to 43.3" (84 - 110cm). Recommended for age 3 years old and up. If you have any questions about this product by YIRAN, contact us by completing and submitting the form below. If you are looking for a specif part number, please include it with your message.